My allergies seem to get worse with each new year… maybe that’s my bodies way of letting me know I’m doing something wrong. This year, I’ve decided to set the medication aside and combat my Spring allergies naturally. We are learning that many of the issues that crop up with our bodies have a direct correlation to our diet, so it makes sense to remove irritant foods and substances (like chemical cleaners) and add beneficial foods, herbs and supplements. Use a Neti Pot with celtic sea salt and distilled water. This will help keep your nasal passages clear. Add a probiotic supplement to help increase your immune system (in addition to the GI benefits) or eat lots active yogurt. Take a tablespoon or two of local, raw honey each day. Start the morning with a peppermint herbal tea or hot water with lemon juice. Take your vitamins and add echinacea and goldenseal. Use HEPA filters for your air and vacuums. Steam things up, take a hot shower or hang out in the sauna. If you experience sinus pressure, try acupressure on your temples and the sides of your nose. Chewing gum sometimes helps alleviate the pressure as well. Eat a (mostly) vegetarian diet, there is no doubt that our bodies do better when we don’t have to process meats. Exercise. Get outside when pollen is the lowest (early morning is usually best when the dew is on the ground keeping everything at bay). Keep your floors clean. Dust, dander and pollen love to fly around. Vacuum and mop frequently. I don’t sweep as it moves the offenders around. Have the kids do the same things you are in child sizes. Be sure to check with the pediatrician about dosing of vitamins, supplements and herbs. 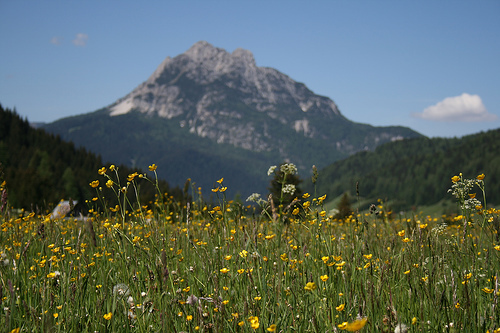 Image “Spring Flowers in Sappada” by ethanol76 on Flickr under Creative Commons. Thanks for this! We are starting to fight the battle here and were looking for better ways to combat those pesky allergies as opposed to popping pills! Just curious… if allergies are an immune over-reaction to things that really shouldn’t be reacted to, then how does boosting the immune system help allergies? Interesting tip about the honey. I guess the argument COULD be made that the toxins and antibiotic etc etc found in NON-organic meats are harder on the body! My sister swears by burning peppermint-eucalyptus oil. That said, I really don’t see what vitamins, echinacea, or goldenseal will do to improve your allergies. I carry an old-fashioned cotton hankie with a drop of German (that the blue one!) chamomile essential oil. I take a good big whiff of it periodically throughout the day during my early spring hay fever season. German chamomile essential oil is extremely soothing to the raw, itchy misery of hay fever. Just breathing it in through the nose comforts the itchy eyes and inflamed mucus membranes of the nose and throat. Be sure you buy a good quality essential oil. You will use only one drop per day, so that tiny 5 ml bottle will last for over 3 months. I’m always surprised when I read suggestions that digesting meat is hard for humans. The reality is that the human body evolved to eat exactly that and it is actually one of the most easily digestible foods. Grains are the hardest foods to digest for the human body – especially gluten grains. I looooove the neti pot – it is a miracle worker. Another good tip is to wrap your pillow and mattress to reduce the contact with dist mites which are another common allergen.